This article was first published on Aug 8, 2016, and updated on June 13, 2017. SINGAPORE - The first vending machine "cafe" at an MRT station has opened at Ang Mo Kio, with five machines serving more than 90 food and beverage options. The Chef-in Box VendCafe occupies a ground floor retail space and offers hot meals, drinks and snacks for under $6. The VendCafe opens from 7am to 11pm daily, and another such space will open at Lakeside MRT next week. Here are some examples of vending machines selling interesting items that are located in Singapore and other countries. Vending machines have replaced a mamak shop in a Housing Board block in Tampines in a joint venture by No Signboard Seafood restaurant chain and logistics company Goodpack. The cluster of six vending machines, called The Ma2 Shop, was opened on Thursday (April 27) at Block 143, Tampines Street 12. The machines operate around the clock in the 150 sq ft space and sell items such as ready-to-eat Japanese oden and snacks, medical supplies and household provisions. A machine serving hot meals including chilli crab spaghetti and chicken rice will be rolled out only on May 27. The machines accept cashless payment methods such as credit cards and ez-link cards. Five other such outlets will be opened by May 27 in HDB void decks. Independent bookstore BooksActually in June launched Singapore's first book vending machines at the National Museum of Singapore and Singapore Visitor Centre at Orchard. 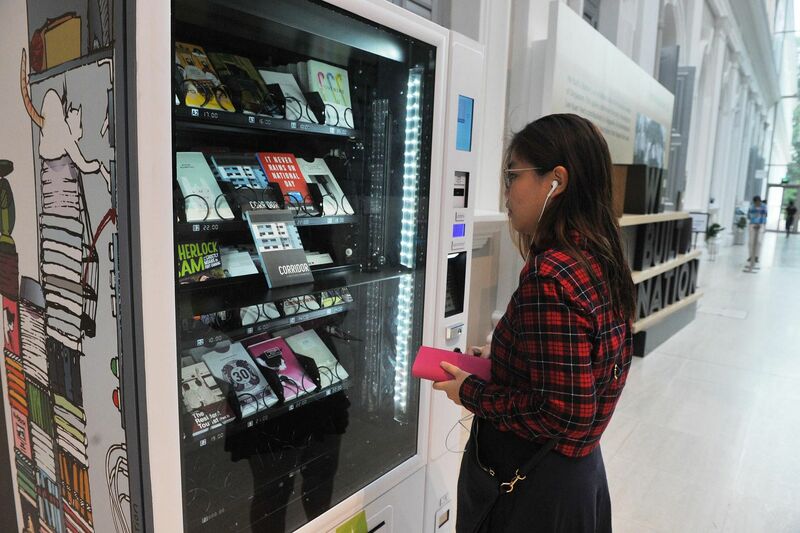 Each vending machine can store about 120 to 150 books that feature the works of Singaporean writers and range from poetry and short stories to graphic novels. 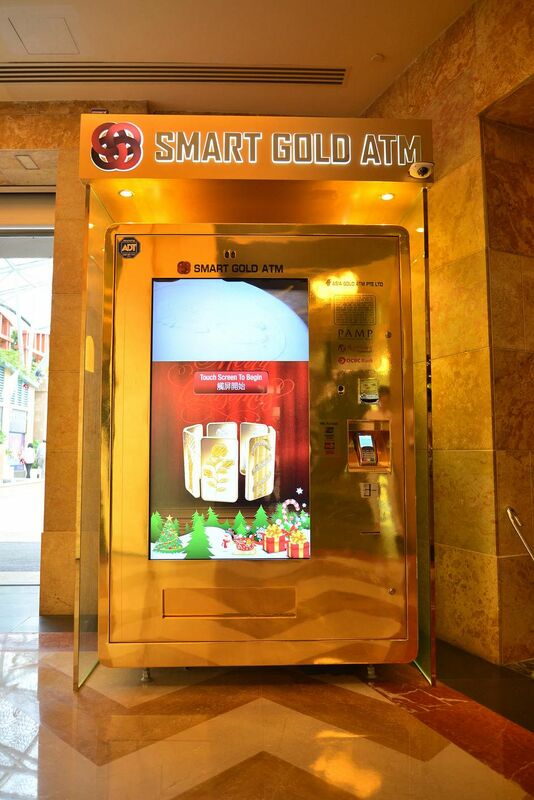 Two Smart gold ATMs that dispense a range of 24 karat gold items made their appearance in September 2014 at the Marina Bay Sands Hotel and Resorts World Sentosa. Customers could choose from one to 10 gram gold bars, silver ingots and customised gold coins. Full-time national servicemen (NSFs) who need to stock up on army supplies can buy them from vending machines by LifestyleMart Express, who installed the machines at White Sands Shopping Mall since December 2016. The items include ziplock bags, batteries, powder, socks, insect repellent and singlets. ST Logistics, which runs army supply store LifestyleMart, set up the vending machines as part of a trial, and NSFs have said it is convenient. A vending machine stocked with the crustaceans first appeared on a street in Hangzhou, the capital city of Zhejiang province, in September 2013. High demand during the crab season from August to October was cited as the reason for the invention, which sold each crab for 25 yuan (S$5). They even came with a vinegar dressing and bags of ginger tea. Basically a giant, building-sized vending machine that dispenses electric cars for rent, the Kandi Machine debuted in Hangzhou in 2013, where it was seen as a viable solution in reducing the city's carbon emissions. Rental costs a little over $3 an hour for one of the compact vehicles, which have an estimated top speed of 80kmh and can travel 120km on a full charge. Machines selling the prized roe, as well as other luxury ingredients like truffles and escargots, were set up at three posh shopping malls in Los Angeles in November 2012. Prices start as cheap as US$5 (S$6.70) to US$500 for an ounce (about 28g) of Imperial River Beluga Caviar. 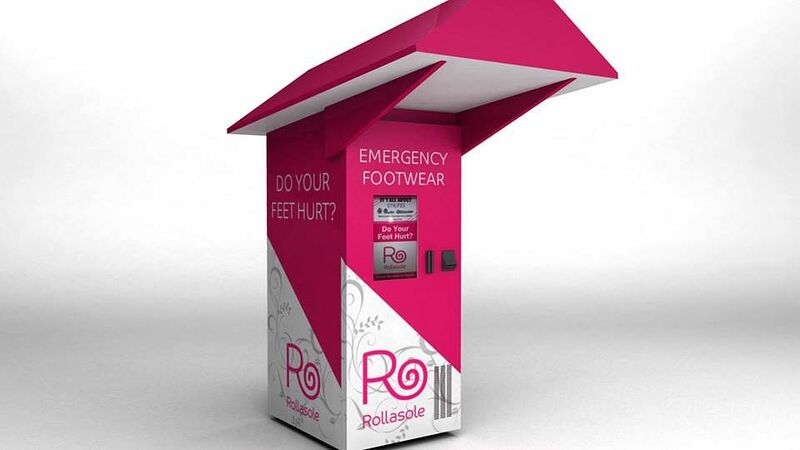 Rollasole vending machines, developed by a British shoe company, branded itself as a place to buy "emergency footwear" when it was launched in Las Vegas in November 2014. Female partygoers are encouraged to ditch their high heels in favour of a pair of comfortable flats for the journey home. Tired of being besieged by customers after he had closed up his store for the day, Parisian baker Jean-Louis Hecht built a vending machine for the country's signature bread. The "Pani Vending" machines, which are stocked daily with partially cooked dough that is baked to crispiness on demand, were unveiled in 2011 during the August holiday season, when Hecht figured that most of his baker competitors would be on vacation. Each loaf, produced in under 30 seconds, costs one euro (S$1.50). Would you trust a vending machine to churn out a national food icon? Mr Claudio Torghele, an Italian entrepreneur and former pasta salesman, unveiled his Let's Pizza machine in 2009. The vending machine mixes flour and water, kneads and bakes the dough, and tops the disc off with tomato sauce, cheese and assorted toppings - "in just two and a half minutes", brags a sign on the machine. Customers can watch the process through a glass window. Pizza prices start around 4 euros (S$6). However, The Daily Mail reported that Mr Torghele has found it difficult to find takers for his invention, which is around thrice the size of a regular vending machine. In 2012, pictures of this unusual vending machine at Munich's main railway station garnered attention from Lego fans online. The high-tech machine allows commuters to browse various Lego sets via touchscreen and make their payment by card. In Japan's Buddhist and Shinto traditions, omamori are a type of religious talisman to ward off ill fortune or receive blessings. Vending machines for those in need of an amulet can be found near popular shrines such as Kyoto's Golden Pavilion temple. Late for a date? 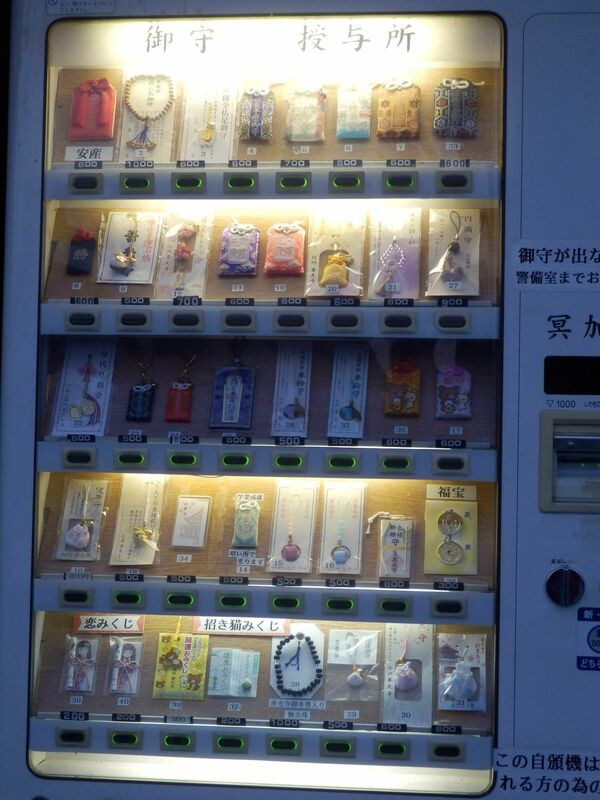 Japan's huge repertoire of vending machines extends to bouquets of flowers. One place to spot them is Shinjuku Station in Tokyo, where floral arrangements go for 2,000 yen ($26.30).